The Flash Fiction Project at Google+ is at it again! There will be a visual prompt for every day in November (despite NaNo), and I'm going to try to write a (very) short piece for it every day as well. Due to time zone differences, I'll try writing and posting mine early in the morning, so it's a day after the original post for me, but still the same for them. He threw his change into the glass and winked at her. Then his facial expression changed rapidly from grinning to uncomfortable. "Be right back, babe," he said and vanished in the direction of the toilets. As her eyes wandered back from following him, she noticed a woman at the bar looking at her. "You know that's a lie, don't you, honey?" "What? Of course he'll be back," she replied, indignant. "Yes, not that. The sign, I mean. 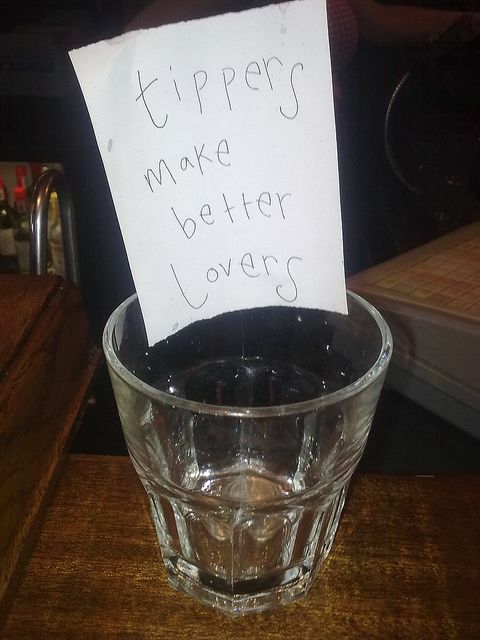 'tippers make better lovers'. It's just the way of the bar to get more money from drunk men, as they throw their change in there and wink at the girl they picked up. In the bedroom, they'll be just like the drunk men anywhere." "You've been with drunk men before?" "The interesting thing is, women aren't like that at all. Drunk women go crazy in bed, and they can keep it up much longer." She inclined her head, curious. "How do you know?" She hesitated. She was drunk enough herself to take her chances with another drunk male, like she'd done so often. On the other hand, she was drunk enough, too, to be curious about that woman... And who'd care next morning, anyway? "Show me," she said. A minute after the two women had left the bar together, he returned from the toilet. "Sorry, mate, Suzie won again." "Man. If there's one thing I really don't like, it's a nymphomaniac lesbian. Give me another beer." He recovered his change from the glass, settled down at the bar again and browsed the throng of customers for another girl worth picking up. Sarah Pohl. Travel theme. Powered by Blogger.